At some point in the history of the United States of America, it became a weirdly consistent tradition for every president, senator, and congressperson to be obsessed with hitting a little white ball across a green field. Arguably no U.S. president in recent memory, though, has been as deeply involved with golf as Donald Trump. Years before he entered the realm of politics, Trump added golf course ownership to his resume, and his many courses have not only hosted numerous championships, but some of his most personal family events. Unfortunately for President Trump, being an extremely public figure means that private business details — especially of the shady variety — have often leaked through the cracks or have been disclosed. While many people have enjoyed whacking their balls across Trump's grass, it seems the dealings behind the scenes have often been sketchy at best and deeply unethical at worst. Here's the truth about Donald Trump's golf courses. How many golf courses does Trump own? To anyone out there who doesn't follow golf, it might be somewhat surprising to discover that Donald Trump has played a big role in the sport for a long time. CNN reports that Trump currently owns 17 golf courses, to be exact, and you can find them pretty much anywhere golf is popular: not only up and down the East Coast United States, from Florida to New York, but also in countries like Scotland, Dubai, and the UAE. In the past, major golf championships have often been played on Trump's courses, such as the PGA Championship and the U.S. Women's Open. As one might imagine, Trump's controversial political turn has, in recent years, complicated his relationship with the golf industry, according to Golf Digest, since organizations like the PGA Tour and USGA usually try to avoid getting involved in partisan battles. One particularly fiery situation occurred in 2016, according to the Telegraph, when the PGA Tour made the decision to move the World Golf Championship from Trump's Miami Course to a site in Mexico City. Back in 2010, according to Golf.com, a man named Martin Greenberg, CEO of the Sterling Commodities Corp., participated in a charity event at Trump's golf course in Westchester County, New York, wherein contestants were offered $1 million if they could smack a hole-in-one. Impossible? Apparently not because Greenberg succeeded with flying colors. Great shot! But when Greenberg went to claim his winnings, the golf course claimed that contest organizers had set up Greenberg's tee just short of the regulated distance, rendering his shot invalid. Whether this was pure deception or an honest mistake plus a ridiculous level of stinginess, Greenberg was understandably upset about the matter, so he sued. Trump ended up settling with Greenberg, agreeing to donate $158,000 to Greenberg's charitable foundation, according to Vox. The prize money didn't come directly from Trump himself, though. Rather, the check was written from Trump's "charity" organization, the Donald J. Trump Foundation, which has a pretty checkered record of charitable activities. 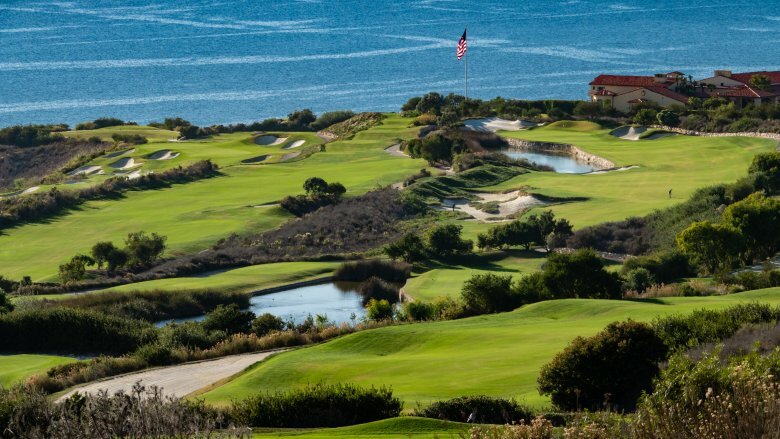 A few of Trump's golf courses have earned stern rebukes from environmental groups due to the damage their construction has caused or could cause to surrounding ecosystems. For example, the Guardian reported in 2018 that the golf resort in Aberdeenshire, Scotland, was guilty of partially destroying a fragile dune system composed of sands and plant life so unique that the area had previously been recognized as a site of special scientific interest by the Scottish Natural Heritage. 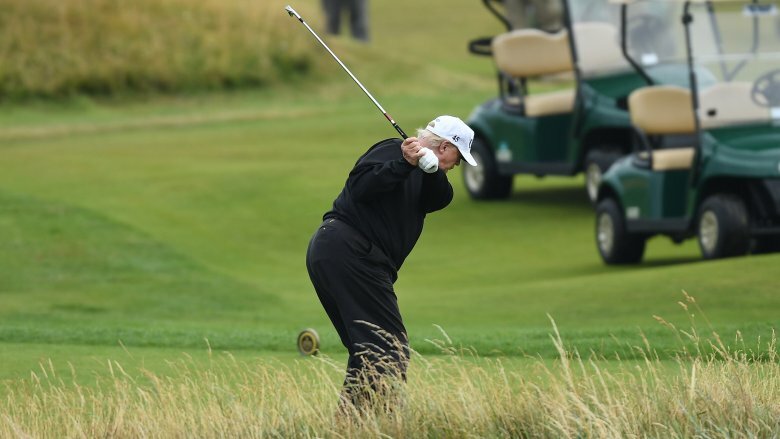 Over in the United States, ABC says a Trump National Golf Course in Virginia was cited for cutting down trees in a protected area that was vulnerable to flooding, less than a decade after previously getting in trouble for chopping down another 400 trees. The justification? They wanted to make a clearer view for guests. Perhaps the most notable battle between a Trump golf course and conservation groups occurred in Ireland, according to the Independent, when Trump's desire to erect a giant rock barrier around three holes of his resort ran into an unexpectedly resilient foe: an itty-bitty little snail. The snail (not pictured) is named Vertigo angustior, and this smallest member of the resistance is a protected species under EU law. 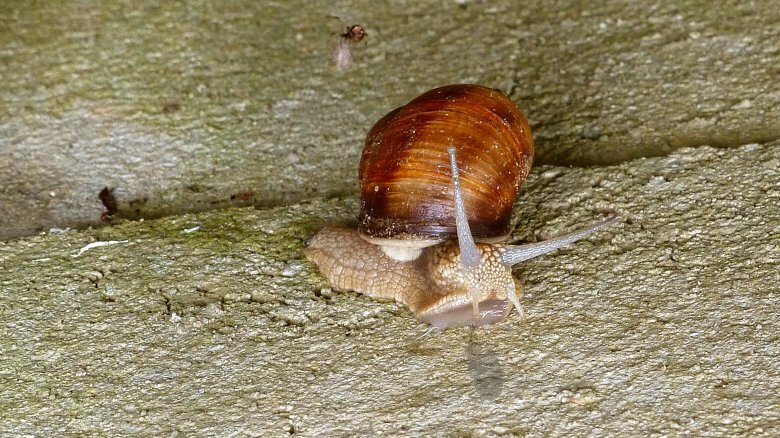 As a result, the Clare County Council argued that Trump's concerns about the holes being flooded if a wall weren't built were not substantial enough to endanger the snails. 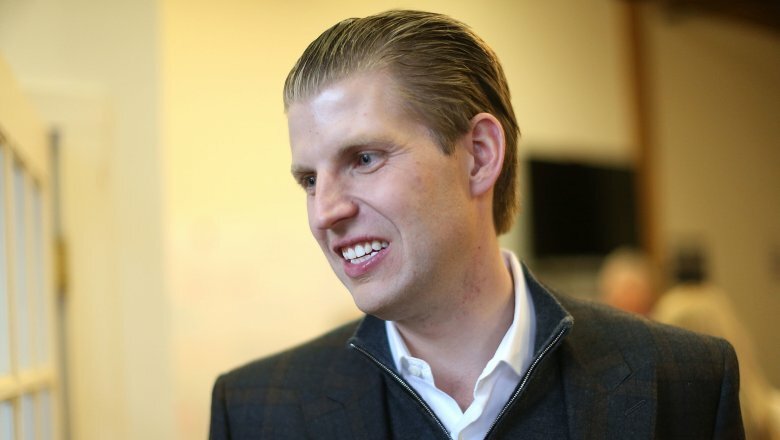 Year after year, according to Forbes, Eric Trump has borrowed his father's Westchester, New York, golf club for the Eric Trump Foundation Golf Invitational: a ritzy charity event where million of dollars are donated to St. Jude's hospital to benefit kids with cancer. As the younger Trump tells it, the greatest advantage to his event is that since it's his father's golf course, he gets to rent it out for free so all the money goes toward helping children with cancer with little upfront cost. Sounds good, right? Unfortunately, Eric's claims don't line up with the actual filings, which demonstrate that Donald Trump's golf club is not a free rental, even for family: Eric's charity event gets billed for ridiculously high, outlandish expenses. Sadly, it also seems that the charity money given to the Eric Trump Foundation has often been used in a self-dealing manner. For example, Eric once used $1,600 of those cancer donations to buy a copper wine still and bottle washer. Another time, the foundation might've paid an artist $25,000 to create a portrait of Eric's father. Worst of all, it has been documented that at least $100,000 of charitable donations from Eric's event were shifted over to the Trump Organization and turned into revenue. To be fair, the Eric Trump Foundation's donations to St. Jude have been beneficial, particularly when it comes to cancer research, which makes it all the sadder that some of these funds have seemingly also been used in such unethical ways. 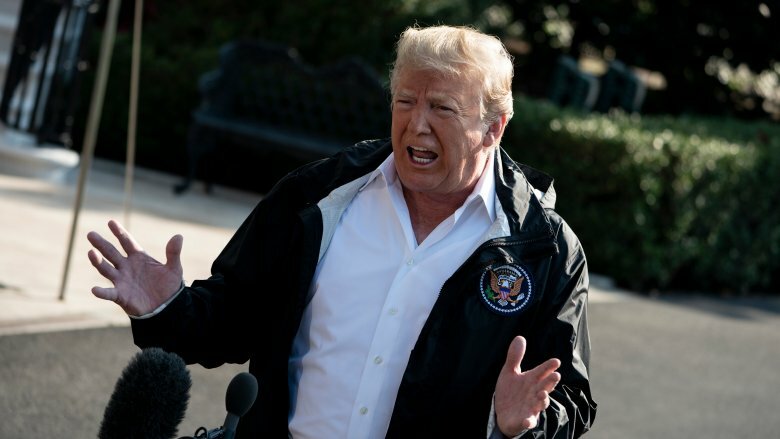 One confusing detail about many of Trump's golf courses is that despite the big tournaments, glitzy decorations, and perfect green grass, they are financial "sinks," i.e., they've lost money, rather than making it. 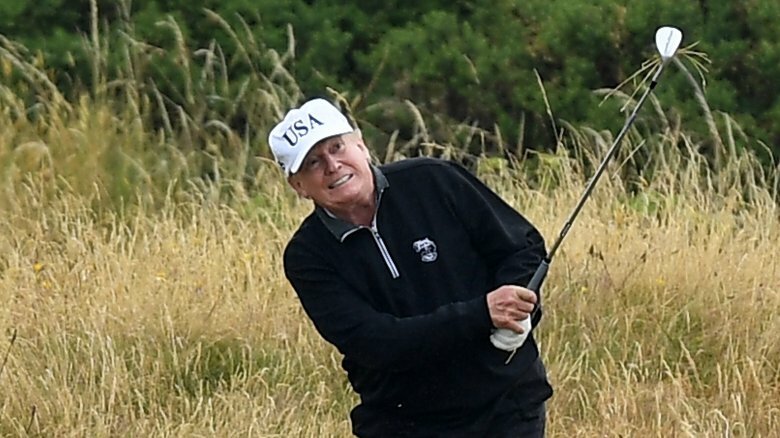 As Mother Jones explains, Trump's two Scottish golf courses cost the now-president $200 million to build, and in 2017 lost a combined total of about $6.2 million. This is a long shot from Trump's original pitch, back in 2008, where he claimed that the Aberdeen resort would be a huge success and would create 6,000 new jobs: In reality, the current number of employees is a not-so-amazing 84. Trump's sons Eric and Donald Jr. currently operate his golf properties, and while Eric has stated that the business is "spectacular," according to CBS — and certain properties, such as the Doral in Miami, have certainly done quite well — the family is notoriously cagey when it comes to giving details. From the outside, the picture doesn't look so great. How these golf courses stay afloat amid such financial issues is another topic entirely, but in the meantime, Market Watch points out that Trump's successful White House bid didn't cause any significant revenue bump from 2016 to 2017, according to disclosure documents. If you were to visit Trump's golf courses in New Jersey, you'd encounter rolling green hills, glistening architecture, and … uh, goats? Yes, goats, the horn-headed animals. 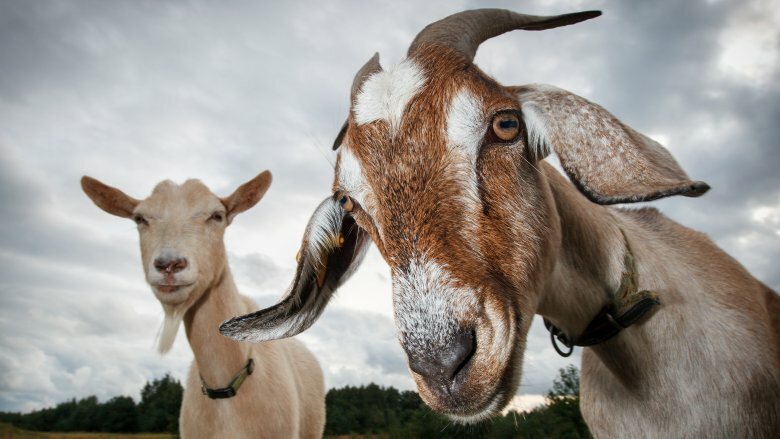 According to Business Insider, Trump keeps real goats on these properties, in addition to participating in hay farming, woodcutting, and so on, as a way to qualify for a special New Jersey tax break for having "farmland." How many goats does it take to qualify? Only eight, apparently. This strange maneuver has allowed Trump to pay an estimated property tax of only $1,000 a year for his enormous golf courses, on property that would normally get taxed at $80,000 a year, in a state that claims some of the highest property taxes in the United States. While plenty of wealthy billionaires, Trump included, have done all kinds of weird things to avoid paying the proper amount of taxes, this may be among the weirdest. 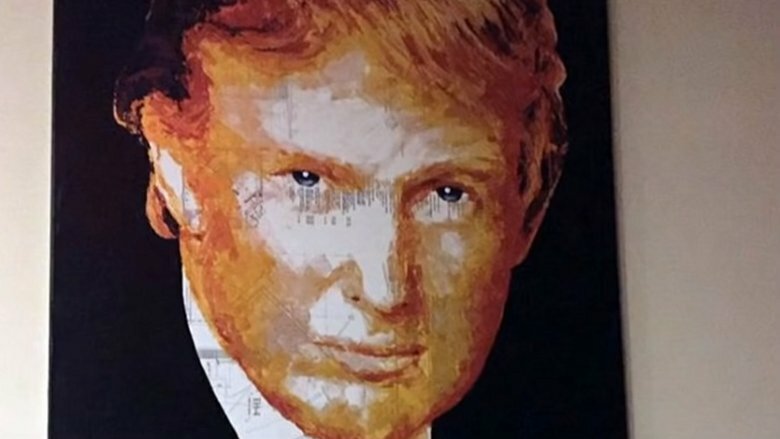 Apparently, if you visit the Trump National Doral Miami golf resort, you might happen upon a 4-foot painting of Donald Trump's face. It isn't that weird, right? Whatever your opinion on Trump, he's certainly the type of guy to hang up many pictures of himself. The strange thing, as the Miami New Times explains, is that Trump actually purchased this painting for $10,000. And he didn't use his personal money, but rather the funds of his own "charity." How does he explain this one? According to Trump's attorney the painting was put up for auction at a Mar-a-Lago event in 2014. Trump tried to get the bidding revved up by putting in a starting bid of $10,000 for the painting. The problem? Nobody else bid, so he won. Oops. 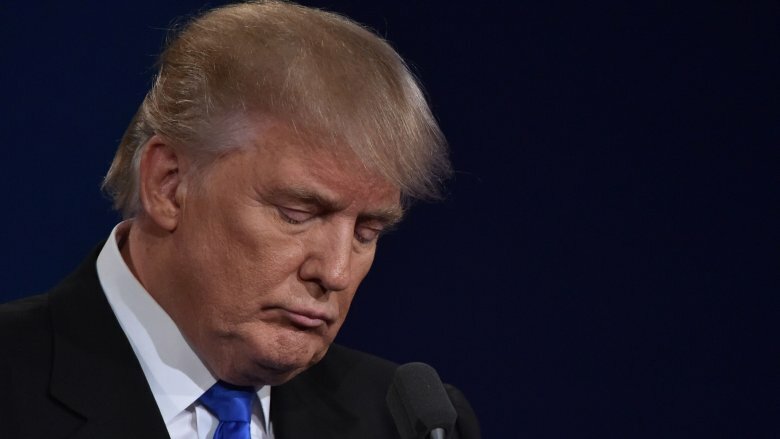 So Trump was stuck buying an expensive and huge portrait of his own face, and rather than take out his own wallet, he simply diverted those aforementioned charity funds from the Trump Foundation. Not surprisingly, this got him into some legal hot water. Bizarrely enough, this situation mirrored a near-identical controversy from 2007, according to the Washington Post, where Trump spent double that amount (again, using charity money, instead of his own) on a 6-foot-tall portrait of himself. In 2012, Donald Trump purchased the Ritz-Carlton golf course in Jupiter, Florida, according to NBC, and for whatever reason, a group of previous members decided to ship out. Under the former rules of the agreement, these members were permitted to continue playing golf on the course until their replacements were found: like it or not, that's the contract they signed. When Trump caught wind of this, though, he wrote a letter to the members of the club saying that, as the new owner, he wanted them gone ASAP and these former rules no longer applied. According to USA Today, Trump also refused to give the former members their refundable deposits, some of which were as high as $210,000. Predictably enough, the old members weren't happy about being stiffed, so they joined together and filed a class-action lawsuit. In 2018, Trump agreed to a settlement with these unhappy former members, paying out a combined $5.44 million to them, about 70 percent of the refund amount they were looking for after legal fees and other expenses. Donald Trump is an avid golf fan, and he cares tremendously about his golf courses, but the one that has (in the past) held a special importance in his life has been the Trump National Golf Club in Bedminster, New Jersey. Back in 2009, Town & Country Magazine says his daughter Ivanka Trump and son-in-law Jared Kushner held their wedding there, with a guest list that included such big names as Rupert Murdoch, Rudy Giuliani, and Andrew Cuomo. 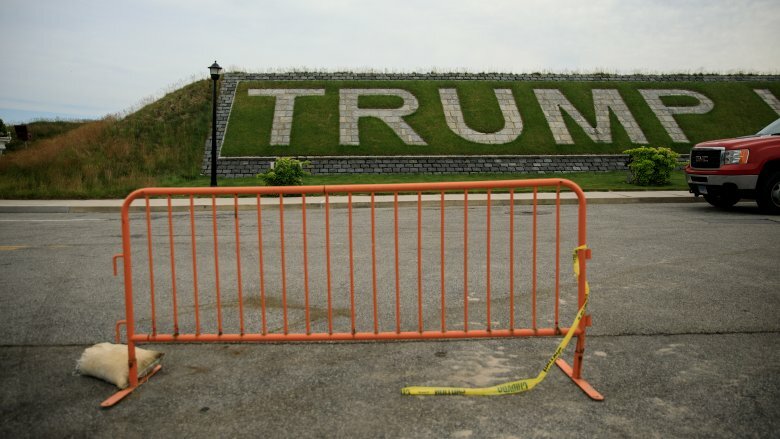 Trump's adoration for the property went so far that in 2012 he even embarked on a mission to have a cemetery built on the club, according to NJ.com, with the idea being that he, his family, and his club members could one day use it as their final resting place. More recently, it seems, Trump has backtracked from that notion. In 2015, NJ.com reported that despite putting in years of effort to get the New Jersey cemetery built, he'd changed his mind and was now considering being buried at one of his Florida properties instead. Sorry, New Jersey! 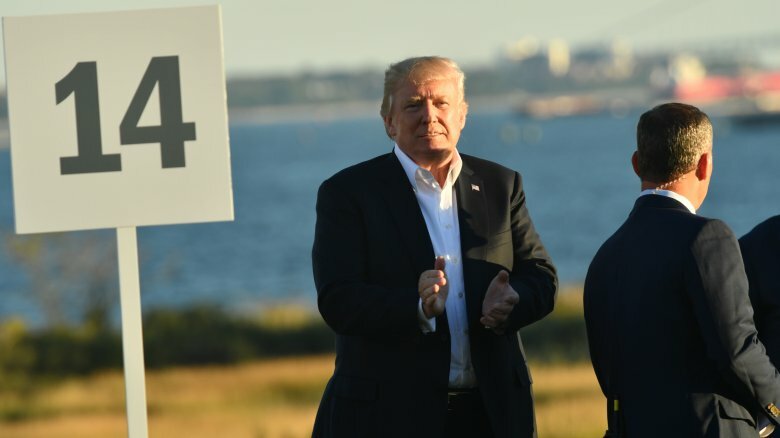 Donald Trump might claim the credit for New York City's Ferry Point golf course, built over the remains of a Bronx garbage dump, but in reality, he didn't put in any of his own money. The $127 million that funded the golf course came from New York's taxpayers, according to the New York Times, but they don't see the profits. That money goes to the Trump Organization, which made a special deal to collect most of the revenue for the next 20 years, as described by CNBC, in exchange for covering upkeep expenses and building a (still missing) $10 million clubhouse. Hmm! Because Trump takes the profits, he got the $8 million that the course made in its first year alone. Keep in mind, Ferry Point is a public course but charges a hefty $175 a round, as opposed to the normal $20 to $50 at other public courses. Recently, Trump's controversial White House stint may have hit the golf course hard, leading to a 12 percent revenue decrease in 2017, reports the Washington Post. While Trump wasn't yet a politician at the point where this deal all went down, this is yet another example of public money being wasted in unfortunate ways. Despite old adages, people pretty much believe everything they read if it sounds authoritative enough. Sometimes this is a problem — like on the internet — but when you see a historical marker, particularly relating to the U.S. Civil War, you can usually be somewhat certain that it has some basis in fact. Not if you're at Trump's golf course in Virginia, though, where a plaque (pictured above) overlooking the Potomac River claims to be the spot of a battle that never occurred. 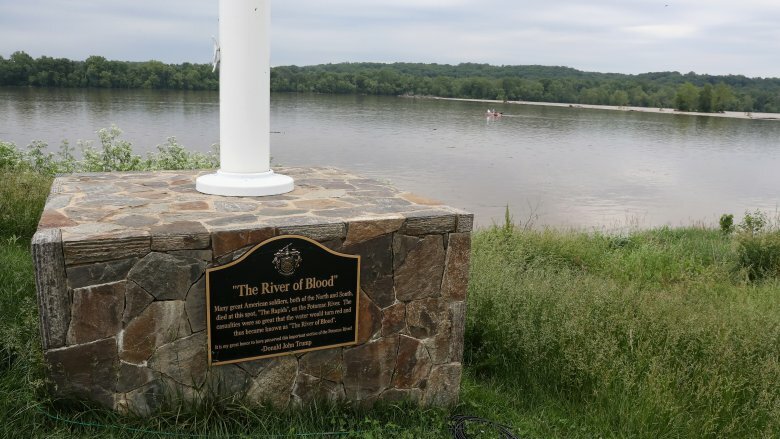 According to the Telegraph, the inaccurate proclamation appears between the 14th and 15th tee, where the sign states that it is planted in the preserved historical location of a vicious battle between Union and Confederate soldiers, which apparently got so gory that the Potomac River turned red and was subsequently nicknamed "River of Blood." In theory, this doesn't seem like so impossible a claim since there were lots of Civil War battles, and they did get quite brutal. According to historians, though, it's a load of hogwash: Richard Gillespie, the executive director of the Mosby Heritage Area Association, told the New York Times that nothing of the sort ever happened. Trump is apparently the only person who has ever suggested this happened. Trump, for his part, continues to assert the plaque's authenticity, despite a total lack of evidence. One area that Trump's golf courses seem to repeatedly do terribly at, according to USA Today, is the matter of paying low-level workers the money they've earned. Unsurprisingly, this has led to plenty of lawsuits over the years. In 2007, for example, a dishwasher named Guy Dorcinvil was forced to sue the Mar-a-Lago resort when he wasn't paid the promised time-and-a-half for all the overtime he accrued over the course of three years. While Trump's lawyers never confessed to their client's wrongdoing, they did reach a settlement agreement to pay the worker $7,500 on the condition that he never discuss the case again. 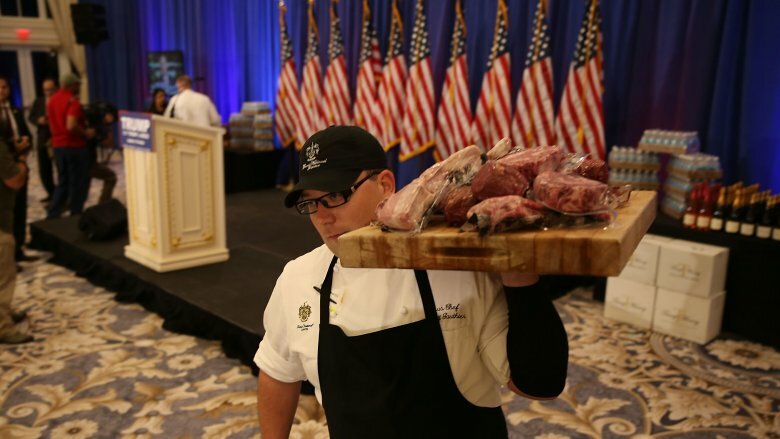 More recently, a group of 48 Trump-employed servers at a Miami resort sued when, after putting in 20-hour days over a 10-day event, they weren't given their overtime pay. Trump's lawyers fought the case, at first trying to blame a contractor, but eventually settled with the workers, paying overtime amounts that averaged about $800 per worker. It might seem hard to believe that the Trump Organization would wage war in these battles, considering the amounts disputed are so minimal to wealthy folks like Trump, but the cases (and settlements) speak for themselves. It raises the question, though: Why can't a billionaire just pay the proper overtime in the first place instead of continually pinching pennies from the workers?